This month we are featuring Chordette for Education, a wonderful tool for creating song sheets and chord charts that are as easy to use as they are to make. It's a leading tool for instruction to Ukulele students of all ages, and heavily used in Music Therapy applications. And it works with 3D Ukulele chords - with Mac support for colored Aquila Kids Strings. 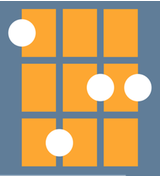 Scales, chord groups, movable chords, fretboard, Transpose chart. They are all here. All files are available as PDFs for download.